Thankfully, institutionalized racism and legal discrimination have been relegated to the ash heap of history. 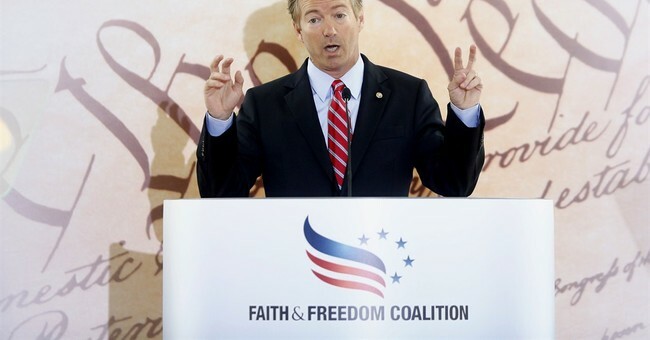 But there are still too many inequalities in American society today, according to Kentucky’s junior Senator Rand Paul. Thus, he writes, it’s high time we live out Martin Luther King Jr’s vision of "racial equality." How? By championing school choice -- and finally giving children from failing public schools a chance to be successful. King’s dream of racial equality has come a long way, but inequalities still exist that can’t be ignored. Too many Americans are trapped in a public education system that does not do our children justice. We have a system in which politicians and bureaucrats have too much control, parents have too little, and students’ needs are not being met. Our children have so much potential, but their natural skills and talents are often ignored. Their true potential is not being realized. Everywhere it is tried, school choice has allowed parents to give their children the education they deserve. Voucher and charter school programs that allow public education dollars to follow the student are greatly improving their performance and giving children so many opportunities. The Wall Street Journal noted in 2010 that 2,000 of our nation’s 20,000 high schools produce roughly 50 percent of all dropouts. Black children have a 50-50 chance of attending one of these schools. Compare these statistics to Washington, D.C., where a Stanford University study showed that 41 percent of students who attend charter schools learned the equivalent of 72 days more in reading and 101 days more in math each year than similar students attending district schools. Our children deserve better — they deserve a choice in education. A pastor friend of mine in Kentucky has called school choice the civil rights issue of our day. He’s right. Those Democrats looking for racism where it doesn’t exist, Krauthammer argues, are merely ignoring the real and more pressing challenges of our time. They are living in a bygone era -- incapable of accepting and internalizing the profound improvements in American race relations over the past fifty years. What a shame. And yet both Paul and Krauthammer almost certainly agree on something else too: access to a quality education in 2013 is paramount. It’s difficult indeed to overemphasize just how important it is today to finally fix America’s broken education system. After all, a good education changes lives. That’s why Republicans and Democrats need to be more committed to this issue, as Dr. Martin Luther King no doubt would have wanted. UPDATE: The video has now been fixed.